London's first "green" double-decker bus has gone into service to help cut carbon emissions. The hybrid vehicle, which runs on diesel and electricity, will produce 40% less carbon dioxide (CO2) emissions than regular buses. 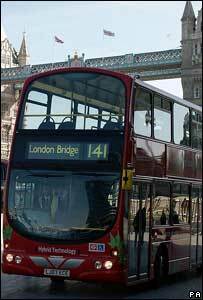 It will operate between Palmers Green and London Bridge on route 141. Mayor Ken Livingstone called for manufacturers to make hybrid buses more financially feasible to speed up their introduction across London. The hybrid bus is a key part of a range of measures designed to meet targets for tackling climate change. Mr Livingstone said: ""This is a world-first for London, marking our commitment to a cleaner, greener public transport network." A battery pack powers the wheels of the new hybrid bus through an electric motor. Unlike conventional buses, energy generated from braking is recycled and used to charge the batteries. A Transport for London (TfL) spokesman said: "We are hoping to add 40 double-decker hybrid buses to the fleet this year and then gradually increase that number." By the time of the 2012 Olympics, TfL aims for every bus purchased for London - up to 500 per year - to be a hybrid bus. Single-deck hybrid buses have been operating on London route 360 since March 2006.